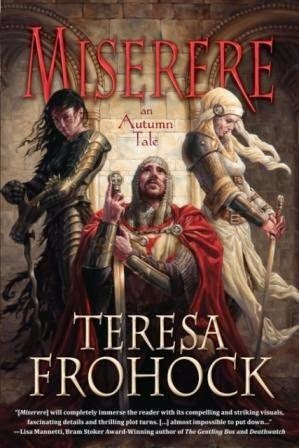 Way back, I asked if you were in to read MISERERE by Teresa Frohock. Life got in the way for me (things are much better now, thanks), but I'm setting a date for my review/group discussion: Thursday April, 16. One week from today. "Exiled exorcist Lucian Negru deserted his lover in Hell in exchange for saving his sister Catarina's soul, but Catarina doesn't want salvation. She wants Lucian to help her fulfill her dark covenant with the Fallen Angels by using his power to open the Hell Gates. Catarina intends to lead the Fallen's hordes out of Hell and into the parallel dimension of Woerld, Heaven's frontline of defense between Earth and Hell. When Lucian refuses to help his sister, she imprisons and cripples him, but Lucian learns that Rachael, the lover he betrayed and abandoned in Hell, is dying from a demonic possession. Determined to rescue Rachael from the demon he unleashed on her soul, Lucian flees his sister, but Catarina's wrath isn't so easy to escape!" A tortured protagonist, demons, and one hell of a horrible family dynamic? I'm in! Are you?